Scarf #4 | Ooh Something Shiny! This is scarf four. As you can tell, I’ll terribly behind, but that’s life. 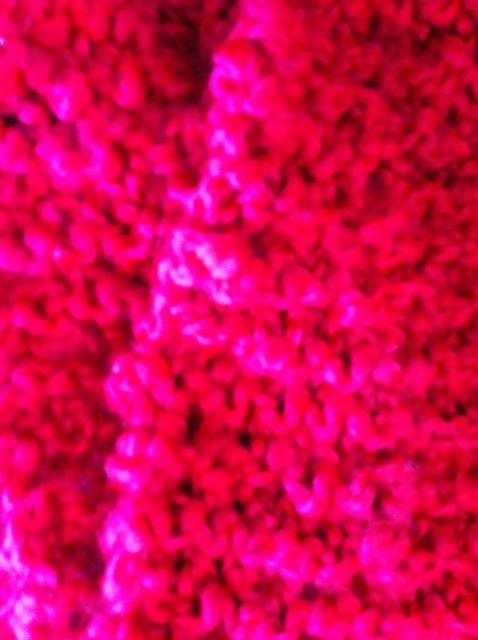 This one is actually a rich cranberry color, but the flash made it look pinky. It lives out of state now. I’m pretty sure that your next mustard yellow scarf that you make needs to live in another which starts with the letter “u”. Just sayin’. You are doing some very good work there missy! Keep it up. Surprise spoiler! It’s more of a baby yellow though.